President Obama will be able to spend as much time campaigning on Election Day as he wants to because he voted in Illinois on Oct. 25. An Explainer reader points out that the Obama family resides more than 700 miles from Chicago, at 1600 Pennsylvania Ave, NW in Washington, D.C. Why is the president eligible to vote in Illinois? Because he's serving the people. Illinois allows anyone who has "resided in this State and in the election district 30 days" before the election to cast a vote. According to judicial interpretation, residence requires both physical presence and an intent to make the residence a "permanent abode." People who own houses in different states can choose to make any of them their official residency for voter registration purposes, as long as they can plausibly argue it's their legitimate home. That would be a close call for the Obamas, who have spent most of the past four years in Washington, D.C., where their children attend school. An article in Chicago magazine noted that a couple who moved into the house next door to the Obamas' Chicago home in September 2011 didn't meet the Obamas until January 2012. Fortunately for the president, the Illinois voter-eligibility statute contains an exception for residents who are absent from the state "on business of the United States." This has no real significance in and of itself. Presidents choosing to vote in their home state is common. And upon checking Washington D.C. voter registration records, Barack Obama does not appear to be registered. But, guess who is registered? Barry Soetoro and he is registered with a White House address. Below is a screenshot courtesy of The Washington Standard. You can verify this completely (unless they pull the records) by going to The District of Columbia Board of Elections. You will need a first name, last name, birthdate and zip code. Barack Obama's birthdate is August 4, 1961 which is also the date that Soetoro used to register. The zip code to use is 20500. 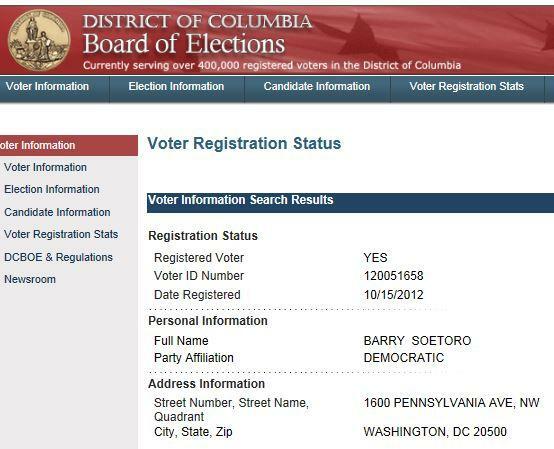 If you use the same info for both Barry Soetoro and Barack Obama you will find that Soetoro is a registered Washington D.C. voter and Barack Obama is not. So the obvious question is the significance. Did someone find a way to register Barry Soetoro knowing that it would eventually come out and make Obama look bad? Or is it possible that our President is so arrogant that he actually registered and may have voted twice? If Barack Obama voted twice or even registered twice I would say it might qualify as a scandal for the ages. Get this in the face of as many people as possible. The more this info gets out, the more chance we have of it falling into the hands of someone who can run with this story and get the truth. My gut feeling is that Barack Obama is arrogant enough that he might have actually tried to pull this off. We all know that voter fraud controversies are not foreign to him. But would he actually be so stupid as to try to vote twice? I don't know. I actually slept on this one because I wanted to make sure I really believed it. Why would anyone be that stupid? Well we have no proof that Obama went there but we do know he has a big ego. People with large egos do things just to see if they can sometimes. It's like a god-complex. They feel like they write the rules. For this reason I am not positive that it was not Barack Obama trying to register twice. Yes, it could have been someone who was having fun or looking to do damage. And it also could have been Obama trying to see if he could get by with it. A voter registration card was likely sent to the White House. Whoever was in receipt of that card did nothing to fix a fraudulent registration if that's what it is. For whatever reason the system didn't not throw a red flag on this registration. With today's technology I would think that if someone tries to register to vote with a White House address it might at least throw up an alert. I am not going to get to the truth this morning but we have enough information to raise a serious question. Did Barack Obama vote twice in November? Even if he did not vote twice and we can prove that he was knowingly registered twice you will have one of the greatest presidential scandals of all time and that's a fact. Hold on folks it is liable to get stranger with this POS. Previous So You Think You Know The Truth About George Zimmerman?